First it was the PCMCIA card, then the CF card and currently, many of us carry USB drives in our pockets. Now, just in time for 2018 planting, you can connect your MyJohnDeere, Raven SlingShot, and/or Climate FieldView Plus accounts directly with your FARMserver account! 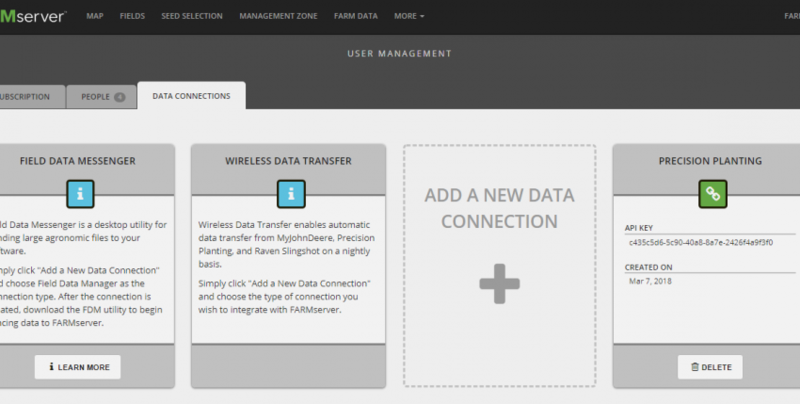 Once you have an established link through the Data Connections tab in FARMserver, application, planting, and harvest data will flow seamlessly from your tractor or combine to FARMserver every night. This means that if you are planting or harvesting today, all the data you collected will show up in FARMserver tomorrow. This also means if you upload your data into MyJohnDeere then the data will also seamlessly transfer from MyJohnDeere to FARMserver. If these vendors don’t apply to you, stay tuned as we are still working to set up wireless connections with AGCO, AgLeader, and CaseIH. While we’re on this subject, another time-saving product now compatible with FARMserver is the SanDisk iXpand Lightning USB. The iXpand USB drive acts just like a USB drive you would currently use to upload, store, or download data from the monitor. Once your data is exported to the USB, simply plug the USB Lightning drive into your iPhone/iPad, open the FARMserver iOS App, and select the upload button. No more zipping files or waiting until the end of the season. It is compatible with all monitors that use a USB drive and works with iPhone 5 and newer, iPad Gen 4 and newer, and all iPad minis. To learn more about wireless data transfer or the SanDisk iXpand Lightning USB, check out our videos in the Help section of FARMserver.